Do you know how to help someone you suspect has overdosed on opioids? This interactive 45-minute online course will provide you with the knowledge and confidence you need to respond to a known or suspected opioid overdose emergency. To recognize the signs and symptoms of an opioid overdose. 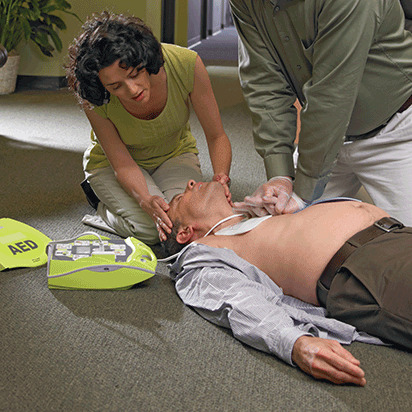 The appropriate care to provide based on the person's breathing and level of responsiveness. How to give naloxone using several different products -- a nasal atomizer, Narcan ® Nasal Spray and EVZIO ® -- to reverse the effects of an opioid overdose. Whether you're adding this course to supplement other first aid training or are taking it as your first exposure to first aid training – you will gain the knowledge you need to respond to an opioid overdose emergency. CPR? Yes, an opioid overdose can lead to cardiac arrest. Cardiac arrest occurs when the heart stops beating or beats too ineffectively to circulate blood to the brain and other vital organs. In the First Aid for Opioid Overdoses Online course, you'll learn when CPR is the appropriate care to give for a suspected opioid overdose. Take the next step. Learn how to perform this potentially life-saving technique.